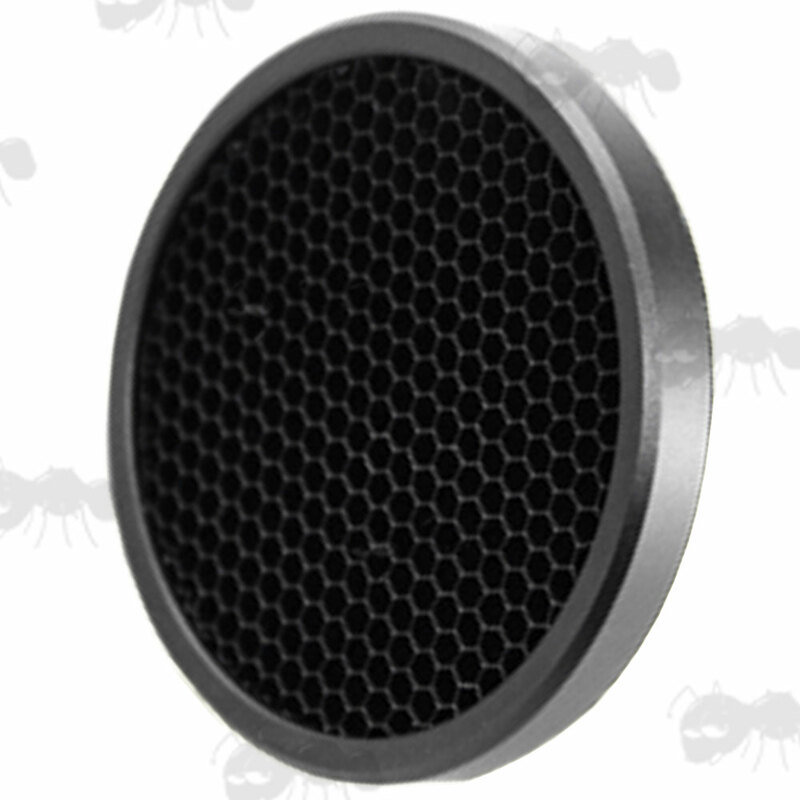 The Kill Flash is an anti-reflection device specially designed to eliminate potentially compromising reflections that give away your position. As well as this, the honeycomb design also protects the lens from impacts, scratching and sun glare while still allowing for a bright view and without interfering with the targeting. The Kill Flash simply screws into the existing threads on the front of your scope while still allowing for the use of a lens cover. 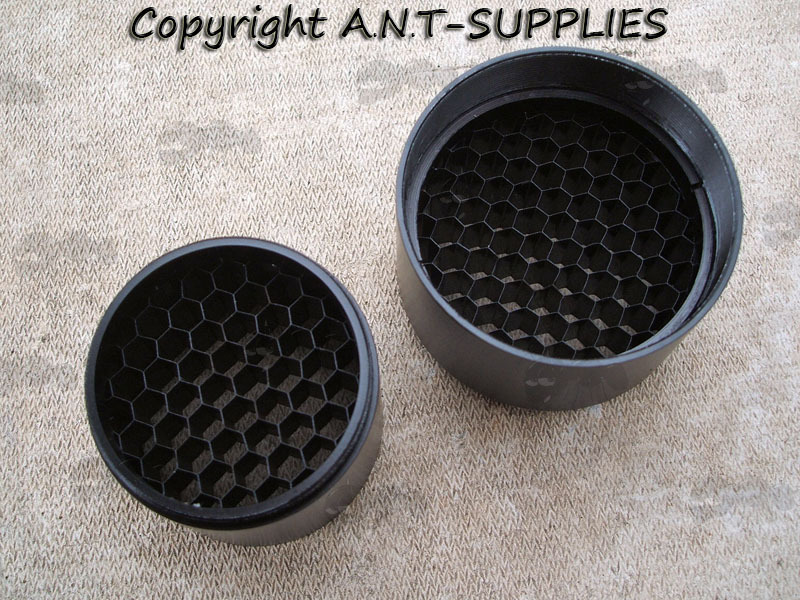 The honeycomb design will reduce the amount of light entering the scope, so possibly not suited to use in low-light conditions. Sunshade with killflash (some models are now killflash only). Aluminium construction with external threads. 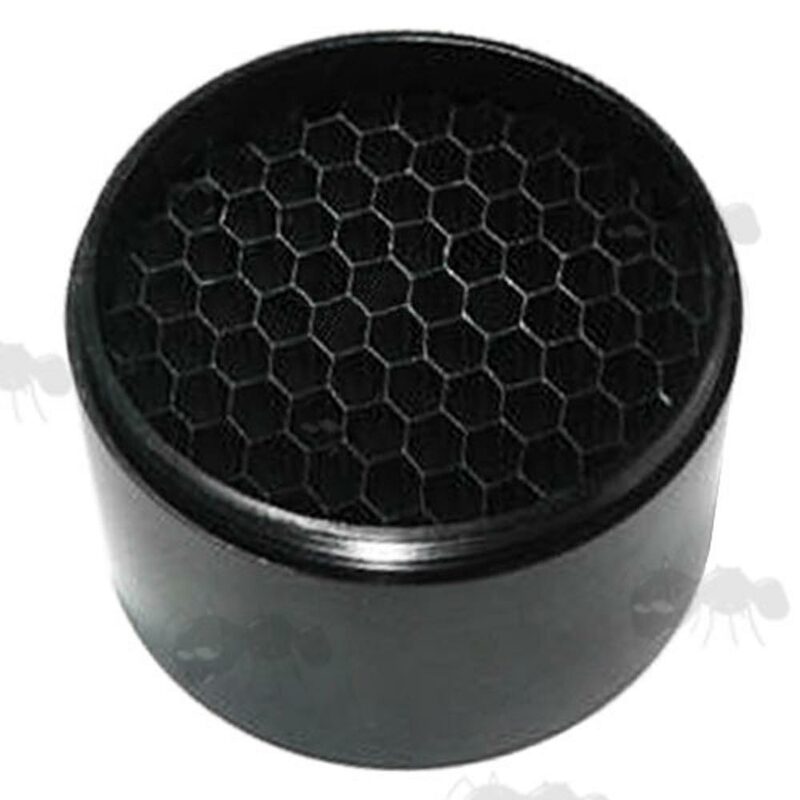 Vector Optics honeycomb filter for rifle scopes. They fit objective ends with inner threads. As there are so many different scopes produced by many factories we can't guarantee these will fit your scope, but we do offer a full refund if it wasn't to fit and then returned with the packaging. Vector Optics are a USA registered brand, made in China under far stricter quality control than the average. Link for similar diameter standard sunshades. The spec's may change from batch to batch, so please feel free to ask first. We now have a range of Hawke Optics Rifle Scope Honey Comb Sunshades. H 51.0mm M49.0 x 0.75mm 7mm 14g 2mm Marcool 44mm scopes. Newly added, fits the Theta sunshade. I 58.0mm M55.0 x 0.75mm 7mm 17g 2mm Marcool 50mm scopes. Newly added, same threads as B. Please note, that it is not possible to reply to questions that are submitted through the survey. Your browser does not support iframes Please note, that it is not possible to reply to questions that are submitted through the survey. A Fits Belarus 3-9x40 with 47mm objective It has a bullet drop reticle from 100 to 800 meters that gets bigger as you increase zoom. It also says waterproof on it. A Needs confirming BSA 4x32 ??? A Needs confirming Hawke HD IR 3-9x50 ??? A Needs confirming Nikko Stirling 3-12x56 ??? B Doesn't fit Hawke Nite Eye 4-16x50 Killflash slightly too small. B Doesn't fit Springfield Armoury Government model 4-16x50 Third generation scope, made in Japan. C Fits MTC OPTISAN-EVX 6-24×50 F1 Fits but won't screw in all the way down, I guess because of the thread? But as good as it's gonna be and does the job. E Fits Nikko Stirling N MM I 4-12x50 ao New, basic, Mount Master model, Illuminated reticule, 4-12 x 50, Adjustable Objective. Reports so far (many thanks). due to the drop-down menu not being selected correctly. We have now changed it to a check box.